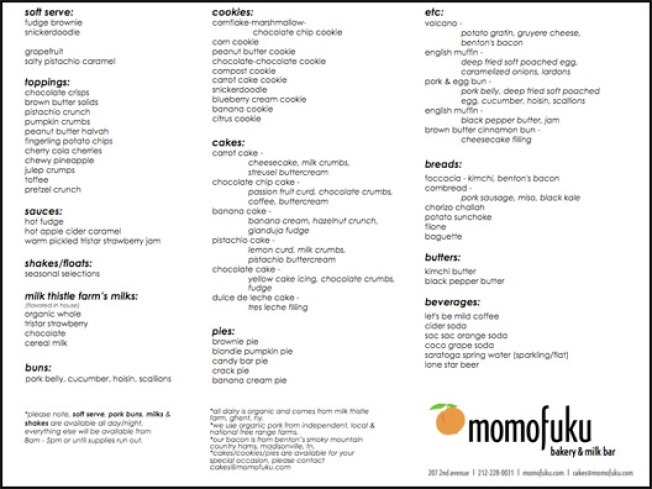 East Village: Feast your eyes on the official, just-this-second released Momofuku Bakery/Milk BarMenu. As promised, there are flavored milks, soft serve flavors, a variety of pork buns, cookies, breads, and "non-traditional pastries." But we also have some serious pie and cake action, and if you'll direct your attention to the right side of the menu please, some intriguing "etc." items including a deep fried poached egg or two and the rumored Volcano. These items can all be yours from 8 a.m. until the closing of Ssam Bar, as early as this Friday.